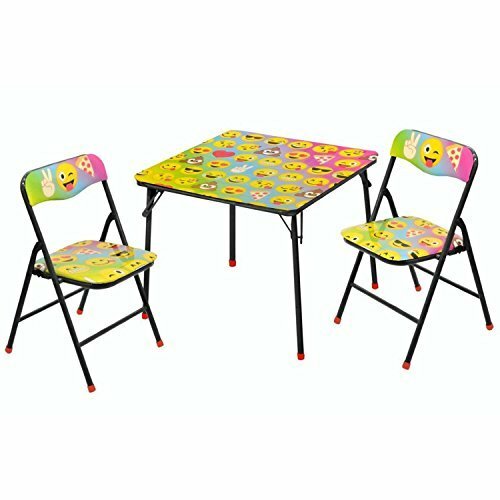 Role playing has never been more fun for your child with our Emoji 3 Piece Table and Chair Set. Your child will enjoy hanging out and discovering new experiences of the world with friends by reading, drawing and doing homework around the house or outdoors with this square kids table and chair Set. Featuring colorful characters and Emoji faces- this square table is sure to become a favorite with your little one. Made of excellent craftsmanship, this toddler table will stay sturdy and beautiful for years to come. These chairs aimed for your toddler and friends are strong enough to hold up to 81lbs. Both the table and chairs fold for easy storage when not in use. It is specially designed to meet high standards of child safety and keeping your child and friends safe. The set requires no assembly and is easy to clean by wiping down with a damp cloth. Table dimensions: 24"L x 24"W x 20"H; Chair Dimensions: 22" H x 13" W x 13" L.
If you have any questions about this product by Idea Nuova, contact us by completing and submitting the form below. If you are looking for a specif part number, please include it with your message.